These two volumes give biographical sketches of all of the United Brethren bishops from 1889-1997. Volume 1 was published in 1996, and Volume 2 was published in 1997. You can buy them individually, or as a set. This first volume covers the 14 bishops from 1889 to 1929, beginning with Bishop Milton Wright (father of the Wright Brothers). The volume was edited by Dr. Paul R. Fetters, then dean of the Huntington College Graduate School of Christian Ministries. Each chapter was written by a different person. 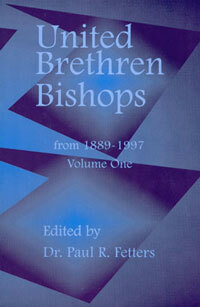 This second volume covers the 14 bishops from 1933 to 1993, concluding with Bishop Ray Seilhamer. The volume was edited by Dr. Paul R. Fetters with J. Edward Gebert. Each chapter was written by a different person.